If you have a disability that, combined with poorly-planned public infrastructure (such as sidewalk furniture), or a lack of public infrastructure, makes commuting difficult — and this doesn’t just have to be about getting around downtown — let’s talk about that infrastructure. Let’s also go meta on how accessible Seattle Transit Blog is to people with various disabilities. How can we serve you better? I’m about to take a trip to the other Washington and most WMATA stations were not built with elevators in mind. One elevator to get from the ground to fare control and one elevator to get from fare control to the platform. It’s worse at transfer stations (L’Enfant Plaza comes to mind) where to get from the lower level to Street you have to take 4 different elevators and visit each platform on your way to the street level elevator. I think it’s important to distinguish between ADA and disabilities generally. There is a tendency to think that ADA compliance is “more than enough” — but there are several things that ADA does not address. One example: Arthritis that makes going down stairs painful to many (even more painful than going up). Then there are those that can’t pick up a piece of luggage or a stroller. Then there are those with bladder issues who need nearby facilities. That’s all on top of things that ADA covers but aren’t implemented well or aren’t reliably operational. I would be curious to hear what considerations are still under addressed even with ADA in place! Having absolutely no enforcement mechanisms besides hiring a lawyer and suing yourself makes the ADA nearly toothless in practice. And it’s relatively easy to drag those proceedings out if you don’t want to have to comply, because businesses have far, far more resources available than disabled people do, 9 times out of 10. Also abled people really need to include disabled people at all stages of design and construction, because quite frankly you’re usually very bad at knowing what works for disabled people and what doesn’t, and most of the time we’re treated as an afterthought at best, or even pitted against each other. I’ve brought it up before but podcasts are completely inaccessible to anyone who can’t listen to them without transcripts. Some people have a hard time standing a long time waiting for a bus without a bench to sit on (e.g., in front of Benaroya Hall, 4th & Cherry, 5th & Cherry, etc). More benches are needed as bus transfer points. Benches WITHOUT hostile anti-homeless features. First you people say manspreading is bad because it takes up more than one seat. Now you tell me anti-sleeping benches are bad because the homeless can’t take up all the seats to sleep. I have no problem with anti-sleeping features. They’re benches, not beds. If someone is significantly larger than average, squeezing into a standard size seat can be uncomfortable or impossible. A bench which can’t accommodate a whole class of people because we don’t want homeless to have a place to sleep is reprehensible. It is reprehensible for the off topic reason of being an inhuman way of handling our societie’s failure to house our poorest. But it is also reprehensible for the on topic reason of not working for many of the users of our system. Manspreading, or really any behavior where someone needlessly, unnecessarily, takes up excess room, is not going to be solved by hostile benches. I’ve seen people put a leg over an arm rest plenty of times. Who is “you people”? People who support transit? People who comment on this blog? Whoever you meant, no group is a monolithic hive mind. Different people can have different opinions on any given topic. I have never heard you people used without it being offensive and ignorant. This is no exception. I know this plea will probably just encourage you, but I will make it anyways. Pretty please, have a little respect and don’t troll on the disabilities topic. Non-hostile benches are hostile to the people who need to sit down, but there’s a person sleeping on it. Preventing disabled people from sitting is an act of hostility and hate. Sitting-only benches are an act of kindness and compassion. They show we care about the elderly and disabled. I agree with TC. This may not be an ADA issue, but more seats makes a bus, light rail, or train stop more comfortable. For instance, on 5th and Northgate Way westbound, there are more seats for catching a bus than either side of the Westlake Station. The seats are integrated into the building structure. Is it crucial, no. But it would be nicer. I pick transfer routes based on whether I want to stand walk or sit. I am lucky enough to live in a place where I can choose the quality and style of commute I want. There is not room for them everywhere, but in general, I would like to see more benches at bus stops. I meant 5th and Northgate Way east bound. Next to the Sprint shop and Jimmy John’s. Does anybody know anything about construction elevators? 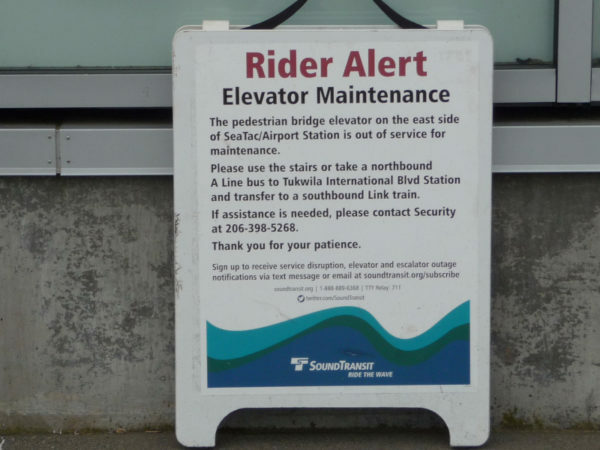 Because for the amount of damage this one single miserable excuse for an elevator has been doing damage to Sound Transit’s passengers, and literally world-wide reputation literally since service began. Until we can physically just install another elevator, if it costs as much as our next ST- to do it, we can rent something that can carry people and their luggage while pretending in its own mind it’s lifting angle iron and sheet-rock or whatever. If we have to hire someone in a hard-hat to run it….I’ve already got a yellow one and a white one, whatever’s regulation. And let Mayor Durkan sign off on my community service for being in contempt of whatever Latin legalese is for “What’ve You Got?” I’m not kidding about this one. Because if there was ever a symbol of every single failing of the governing mentality of Sound Transit’s whole service area….thanks for the living color picture of it. Dori? Maggie? John Niles? The Seattle Times Editorial Board? Bob Hasegawa? Steve O’ban? Why’s this getting a pass? A general purpose busway wouldn’t get away with this atrocity, would it? Mike, I think you’re referring to the movie called “Brazil”, where Monty Python finally creats a plausible picture of England in the grip of Orwellian tyranny. Whose ideology bases not on power hunger, but on massive civil technical and clerical incompetence. A guerrilla organization indeed develops, whose operatives perform needed services exactly like elevator repair…..but without a Work Order! Though I think main targets were the “DUCTS” that connected everything. Maybe we can make an elevator count as a duct. I’m very serious about bringing in a temporary elevator connecting the 574-RapidRide stop with the bridge across International Boulevard to Sea-Tac Airport LINK Station. The ST 574 Express bus connection with Tacoma and points south (should originate in Olympia and serve Dupont) makes this elevator an extremely large-size Regional deal. Both for the Airport and also transfer to a single-seat (ok, standing-space) ride to a steadily expanding list of Link destinations. How realistic temporary elevator replacement would be elsewhere, [OT] here. There’s obviously room for the structure. And its very conspicuousness will make it a perfect symbol for the very approach our Region’s every governmental agency needs most to adopt. Really do get the rental company’s permission to paint the hardware ST blue, green, and white. I often roll my eyes at anyone who thinks that Portland’s at grade based system isn’t a better system for mobility challenged individuals, whether it is ADA, arthritis or any other mobility curtailment,. Sure, at grade stations have some undesirable characteristics, but they are so much easier on the legs and on mobility challenged individuals in general. In Medellin the stations I used all had fairly steep flights of stairs to the platforms, and carrying luggage was a challenge; the elevators never appeared operational. I guess you could say the system worked great for the masses with a dog-eat-dog movement mentality but it wasn’t very handicap friendly. I recently rode Panama City’s Metro and it made me feel like I was part of an Escher painting, a lot of vertical motion for very little transfer progress. I’m sure there are people who would be psyched out by having to navigate such us system and the cost of keeping the escalators running is enormous. It’s hard to find a perfect solution for all. I think a ramp would be nice but no space for one at most statipns. I have bad knees and sometimes cannot take the stairs. The stairs themselves are not the problem. It is the rise/run of standard stairs. The ones at the the UW light rail station bridge are an example of a set that is better for me. However, like the ramp, it takes up more room. The best situation for me is an fully functioning escalator in both directions. We have the worst of all choices. We either do not have all 3 modes (elevator, escalator, stairs), or we have 2 of those 3 not work. Can I give a quote from a famous disabled person, since this post is about disabilities? les, blame plate tectonics or a missed asteroid collision, but the cosmos never has been fair. Portland’s flat and we’re not. But our escalelevatorial disaster is a hundred percent a bad governing habit of mind. Can we get this one elevator crowd-funded? A kindly virtual world population has taken pity on lesser abominations. Somebody at least help out with a pathetic name. In addition to the kind of names it’s already got. The Somali business community along the route are straightforward and active people. Can we make any effort to enlist their assistance? That sign is literally right out there where the whole arriving and departing World can see it. Wouldn’t be surprised if it’s got its own right wing Ukrainian website where America’s enemies can laugh at us. And liberal democrats however we define ourselves….this one is truly ours to own. A yard in this condition, we’d get issued a perimeter fence of “Owner Will Maintain” signs signed by the whole world! So: Давайте просто зробимо це. Будь ласка? The self described experts who fill up the comments section here are very much an example of monolithic hive think. As a stroke survivor the elevator and escalator situation on link is out of control. It seems the system was planned pretty well but they cannot keep the facilities up and running. Can’t wait to see who ST decides to blame for their crappy system after March 23rd. when they have the tunnel exclusively for the toy train. Link has its flaws, but it’s certainly not a toy train. It has high ridership because it serves many of the most popular destinations in Seattle. Haven’t you noticed that the “Hive” criticizes the elevators ALL. THE. TIME? Half the time the sign in the picture is lying anyways. Locals are beginning to ignore it and use the elevator even with the sign there. It appears that the sign is put out any morning that Kone has scheduled maintenance, but the elevator itself is not locked. Even if the maintenance doesn’t happen until 6pm. There’s a lesson or two to be learned here. Also your State and Federal elected representatives….forget if their mail still works, but never hurts to remind them you still know their names. Mark Dublin, contacting Sound Transit or Metro Transit is an exercise in masturbatory sophistry. They haven’t cared about the community since before the Bus Tunnel opened in the case of Metro. Also, I believe my complaint would yield the diametric opposite of my intented desire. I’d prefer the elevator stay open and the sign only used when actually needed. If I complain, they’ll just lock the elevator when they put the sign up. I’m curious. What exactly were you thinking I should say to Metro or Sound Transit? I’m all about correcting the current behavior I see from both organizations so I’d love useful advice. Mark Dublin, I remember you once said you live in Olympia. I have an assignment for you. There’s a new type of interchange in Lacey. I’d like you to go evaluate the interchange in person, then report back here. If you do a good job, I will give you the title of Seattle Transit Blog Comment Section Sound Sound Bureau Chief. Dude, they even have these in Missouri. So they’re acceptable to your Red Party Overlords. Montlake Freeway Station, of course, has no wheelchair accessibility at all in the eastbound, while the weekend bus network imposes a huge time penalty for anyone that must reroute to avoid it. No longer any buses from 1st Ave. South (Pioneer Square) or just 1st Ave. up the hill to 3rd where all the buses are. I work near 1st and Yesler and can’t walk up the hill to 3rd to catch a bus to West Seattle. There are those blue and orange shuttles, but no place to sit to wait for them, and I can’t stand that long either. I end up having to use Uber or Lyft. I guess no one else is bothered by this, because it’s been this way over a year, and probably won’t change until the Center City Connector happens. Also overcrowded buses that make it hard for someone who needs to sit down on the bus. I’d love to see the 10/12 return to 1st until the Madison BRT work pushes it away. As to “anyone else” being bothered by the lack of service there, the rest of us get ignored by agencies too. The problem with the old 10/12 routing was there were stops that were on very steep hills and thus impsssible to access by a number of people. The only solution I can think of there is to close 3rd to through auto traffic and put a platform in the center of 3rd where crossing buses could stop. You’d have to narrow 3rd to a single north and south lane. You’d have to make sure the lights got equipped with transit time extenders so that crossing buses never wound up getting stuck in the intersection. It would significantly reduce capacity on 3rd, but I don’t know what else to do for cross bus traffic that needs to transfer there. I don’t understand your logic. Disconnecting the 10/12 didn’t change where they climb the hill. The same problem is there whether they serve 1st or not. I agree with Norah about the overcrowded buses. These are a real hardship for people who cannot stand. The only reason I didn’t mention it here was because this is a thread about infrastructure. It’s been mentioned before, but improvements to signage / wayfinding could make a big difference to a lot of people. Also, when riding in one of the rear cars on Link, I’ve noticed the audible announcements will sometimes cut out or not work at all, like the connection is loose or something. This is just a basic service thing that should work 100% of the time, but it doesn’t. As someone who’s had ongoing disabilities I haven’t used Seatacs’ public transit. It looked too complicated and strenuous to get there.